Creating a successful sales product requires a team that’s outstanding at understanding. Successful collaboration creates products that convert. Without that collaboration, your team members will make each other miserable while progress hobbles to a frustrating halt. When it comes to the marketer’s needs and the developer’s needs, each teammate has a unique focus. And both of these individuals are crucial for moving your project forward. Your marketer’s main focus is converting prospects into paying customers. Marketers gain customers by focusing on developing successful strategies and tools. And (unfortunately for developers) they usually don’t understand the technicalities of backend coding. Marketing media that helps close sales faster. The marketing process can be time-consuming. It takes several approaches to convert prospects to buyers, and each one must be effective. Advertising materials they can easily modify. Marketers want to make changes on their own as needs arise. And they want to do it without a hassle. Visuals that keep pace with today. Marketers are often forced to work with ad media that is technically outdated or no longer matches the company’s current brand. Visuals that are current and relevant make their presentations easier and more productive. Ad materials that don’t require advanced design skills. Ideally, marketers would love to use pre-designed templates to create ad packages. They want seamless adaptation to new content. And they don’t want to have to wait to consult with a designer. Materials that allow for experimentation. Marketers must gauge effectiveness using different ad formats, a/b testing metrics, and methods for reaching prospects. They need media they can modify and test in different presentation formats. Basically, your marketers just want ad materials that work! Meanwhile, the developer is challenged with bringing the marketer’s requests into reality as a functional, responsive product. A clear understanding of the marketer’s vision for the final product. A checklist of product features and user interface needs. Content data and graphics files for each site page. To implement any special functionality requested. For example: data capture forms, ecommerce and payment processing, and embedded social media. Developers must also ensure their code is compliant and responsive. It should meet standards and display correctly in popular browsers. Developers are not always designers, and rarely are they marketers. Their task is technical and they require specific instructions. Developers can’t write code without a clear picture of the marketer’s vision for the product. The conflict arises for developers when marketers struggle to clarify what they want. Marketers and developers come together around the shared goal of achieving conversions. They both want prospects to buy and happily keep coming back for more. Populr allows you to create and share one-pagers that help you convert prospects to buyers. With Populr, your marketers can be more productive. They can rewrite content and make quick design changes to your ad media. Populr’s professional themes provide a beautiful selection of responsive layouts. It also simplifies marketing tools like a/b testing, saving additional design and developer expense. Luckily for developers, there’s also no need for marketers to struggle to articulate what they want. Populr’s available page templates offer the most effective advertising formats, and allow marketers to easily share their vision for the final product. Your marketers will find Populr excellent for building a branded and successful prospecting strategy. And your developers will thank you. Marketers and creatives are different. Although they are both capable of yielding a fantastic product, the way they approach the process is extremely different. Marketers are motivated to test and tweak a product, knowing that it often evolves into something completely different in the end. Creatives (such as designers) begin with a specific set of instructions, and they follow them. Their final product is a direct result of their initial outline. Once a marketer has the “finished” web page in hand, they begin their own testing process. This includes many small changes until the content is how they want it. Because the marketer doesn’t take the web page as-is, the designer (who simply followed instructions) assumes what they made isn’t good enough. This isn’t the case – the marketers are just following their own process. But a designer takes that response personally. And from the designer’s perspective, the marketer should’ve taken the time initially to think through what they wanted. One of the biggest points of friction with designers is the content. If the content isn’t ready, the designer can’t work. As a result, the designer must use place-holders and try to guess how much space is needed. And 9 times out of 10, when the content finally is ready and put into the design after-the-fact, it doesn’t flow well. Designers prefer to use a detailed initial outline, follow it precisely, and create a great product. To do this, designers need as much detail as possible about the content upfront. But marketers don’t always know specifically what they want prior to starting a project. Their focus is on testing, analyzing feedback and potential future changes. Populr can help marketers resolve these problems, and many more. Marketers no longer have to wait for the designer to build a page. They can start working on content right away – putting together campaigns, landing pages, or entire sections of a website. Marketers also have time to get the content together, using a tool that helps them visualize the final product. The process is rewarding for designers, too. Populr’s customizable templates help marketers envision a final product and deliver more precise information to the designers. When the marketer creates a detailed POP, it gives the designer all the information they need to build a page – without having to make so many changes after the fact. Using Populr’s design solutions, marketers have access to effective tools to get a project done. They don’t have to wait on other departments with the ability to easily embed functional items like forms, videos and ecommerce products. And with the ability to test and tweak in the pre-design phase—before passing them onto designers—a marketer can build a working relationship that lasts. When it comes down to it, we can spend all day telling you how Populr is a good solution to your marketing needs. But, we would rather show you. Here are 7 of our favorite POPs created for marketing purposes. 1. 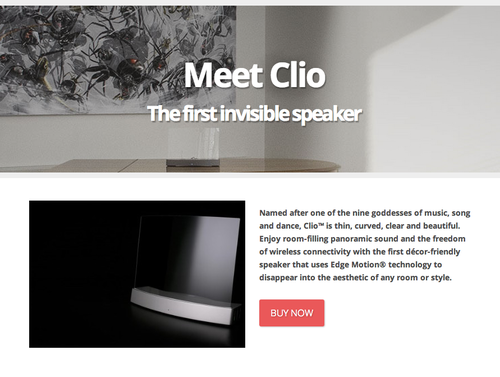 Clio, the invisible speaker, creates a comprehensive marketing page. When you think of how to deliver a great presentation, you usually think of delivering it through a projector. But what about one-on-one sales meetings? Obviously projectors are out of the picture for anything less than a room of people. Most salespeople stick with what they’ve always done: paper slides, sketches or just talking the prospect through a presentation without any visual aids. But presentations have evolved. And the iPad has made personal presentations possible. When used intelligently, this mobile device is a game changer for any presentation or audience. 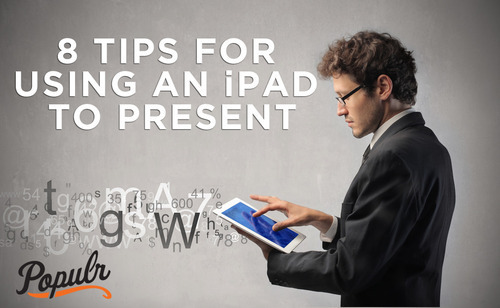 Here are 8 ways to take advantage of the iPad’s strengths when delivering your next presentation. Touching something has the power to decrease anxiety and increase positive thought patterns. It is also a long forgotten tool in our modern era when attempting to connect someone to an idea. No longer does our idea have to live on a screen 5-12 feet away from our audience. The iPad enables us to not just show and tell, but to show, tell, and let them touch. Play to the iPad’s strengths by passing it around a board room or, in a personal pitch, letting a prospect hold it while you flip and point.